When a new company registration is submitted to Companies House the Memorandum and Articles of Association of the company will be sent as part of the application. The Memorandum and Articles are the rule book of the company. They lay out the rules for voting on things like getting rid of company directors and who can get a dividend from the shares. The Memorandum and Articles can also be customised to give the company a specific purpose but this is only normally done with non-profit companies. The vast majority of limited companies that get setup in the UK use model Memorandum and Articles. These are the standard rules for limited companies and will always be accepted by Companies House. When your company has been registered Companies House will send you back a copy of your Memorandum and Articles, showing that they have been accepted. As well as the Memorandum and Articles of Association your company will get a Certificate of Incorporation when it is registered. We often refer to this as the birth certificate of the company. It shows the name you have registered, the date and the company number. These days the Certificate of Incorporation comes as a PDF but it is a good idea to keep a hard copy somewhere safe (you can always frame it if you like). 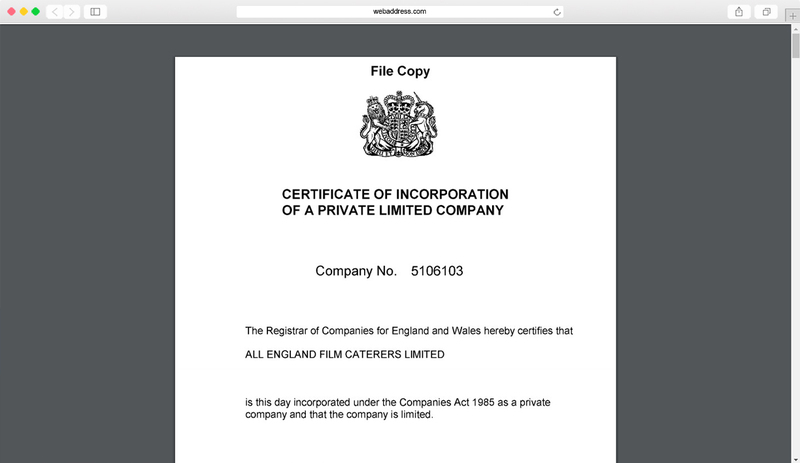 An example of a Certifcate of Incorporation for a limited company registered in England and Wales.